Undocumented citizens should have to come forward, they should have to self-identify, they should pay a penalty and back taxes, and then I think they should go on a probationary period, uh, and then the border needs to be secured. The Senate bill has a provision in there that somebody in the administration ultimately makes a determination that the border is secured, before those who have legal status can then be in the line for citizenship. I think at some point, uh ... The issue, I think there needs to be a secure border. And I think when that happens, and people have paid their back taxes, and uh, they haven't committed any violation of laws, they've been here on a probationary period, then they can apply for citizenship and go to the back of the line. There's no such thing as an "undocumented citizen". 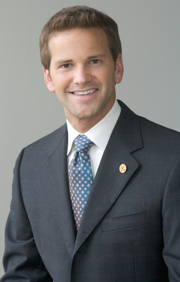 Schock has embraced activist language created by La Raza and the ACLU. One would think that a lawmaker would use legally accurate terminology, but he seems to be too frightened to do so. Schock claims that illegal aliens should have to self-identify. The lawmaker is apparently unaware that existing law requires all aliens to come forward and register with the government after being in the country for 30 days (8 U.S.C. § 1302). If he wanted illegal aliens to "self-identify", the congressman could simply demand that President Obama enforce existing law. But if he's unwilling to do so, why should one expect him to demand that Obama enforce the provisions of a new immigration bill? It is likely that many enforcement provisions in an amnesty will also simply go unenforced. At a recent closed-door meeting at the White House, Obama promised La Raza activists that he would "revisit" certain provisions he disagrees with after the amnesty becomes law. Schock says that illegal aliens should have to "pay a penalty and back taxes". For starters, the penalties in the Senate bill can be waived, so perhaps he'll work to remove the ability of DHS to offer waivers in a House immigration bill. But Schock also says that illegal aliens should have to pay back taxes. The Senate bill does not contain a requirement that aliens pay back taxes for the years they worked off the books. Instead, illegal aliens applying to amnesty must simply clear up any existing problems they have with the IRS in the rare instance that the alien has been previously audited. This requirement will apply to nearly nobody. The requirement that aliens pay back taxes for the years they've worked off the books was never included in the final version of the Senate bill, meaning that illegal aliens get a pass for lawlessness while U.S. citizens do not. If Schock honestly believes that amnesty applicants should have to pay back taxes, then he will demand it is part of a House immigration bill. Schock says that illegal aliens should go on a probationary period. It is unclear what purpose this would serve. Once an illegal alien requires legal status — as the Senate bill would provide six months after the bill becomes law — an illegal alien is entitled to a work permit, driver's license, a Social Security account, and many other state and federal benefits. No enforcement programs or border security needs to be in place. Eventually the alien can adjust his legal status and become a U.S. citizen, and the time period between the two legal statuses is apparently what the congressman considers a "probationary" period. But he doesn't explain the point of the period. Does he propose deporting legalized aliens before they receive citizenship if they commit certain crimes? Which crimes? More than likely, once an alien receives legal status at the outset, the alien will never be returned home. Schock apparently has a lot of faith in the Obama administration measuring the status of border security, noting that "somebody in the administration ultimately makes a determination that the border is secured." He doesn't say who, but the person responsible for certifying the border is secured is the DHS secretary. Once that determination is made, no matter how far from reality it may be, the legalized illegal aliens will then be able to adjust to citizenship status. Schock could demand that a 2/3 vote from Congress is necessary to certify that the border is secure. Or perhaps all 50 governors should be given the authority to certify. But Schock seems to really trust the administration on this even though the White House already believes it has control of most of the border. This is the same administration that has undermined immigration enforcement, lawlessly granted work permits to millions of illegal aliens via Deferred Action, and is being sued by immigration law enforcement officials who are being prevented from doing their jobs. The congressman was pressed on whether he thinks the border needs to be secured before illegal aliens receive legal status, or whether the border security would have to happen only prior to aliens adjusting from legal status to citizenship. He responded that he supports giving all illegal aliens legal status at the outset and requiring border security happen later, presumably before aliens can adjust their new legal status to citizenship status. But what happens if the White House drags its feet on border security, E-Verify, or one of the other enforcement requirements? Does Schock believe he would be able to prevent illegal aliens from acquiring citizenship? How so? Schock claims that illegal aliens who are legalized under an amnesty will have to "go to the back of the line" when they apply to become citizens. The reality is that illegal aliens get to stay in the country the moment they apply for amnesty. If they pass the simple background check, they receive legal status and nearly all the benefits of citizenship, including a work permit, a Social Security account, travel documents, a driver's license, and many additional state-level benefits. While green card status may be delayed for a period of years, it is undeniable that amnesty applicants are in a much better position compared to those overseas who have applied to come to the United States legally. The amnesty applicant is only in the "back of the line" in the sense that the green card — and eventual U.S. citizenship — would allegedly be delayed until after all existing green card applications are processed. But the fact is the genuine back of the line is in the illegal alien's home country. People applying legally from overseas are truly at the back of the line. This is one reason why amnesty encourages illegal immigration. Perhaps the most interesting claim from Rep. Schock is that he supports a bill that would only allow legalized illegal aliens to acquire U.S. citizenship if they "haven't committed any violation of laws". Of course, nearly all illegal aliens are violating a number laws, particularly those who are holding jobs. Many are violating statutes related to ID fraud, Social Security fraud, and perjury, for example. Some of these violations create real victims. Does Schock intend that illegal aliens who are violating these laws will be denied citizenship? Or does he want to give this lawlessness a pass? If it is the latter, he is saying that he believes illegal aliens should not be held to the same standard as U.S. citizens. For a list of the many laws the average illegal alien is violating, see our report titled, "The Myth of the 'Otherwise Law-Abiding' Illegal Alien". Rep. Schock appears to be on the pathway to becoming one of "Schumer's Republicans", a politician spending his limited political capital to help Obama have a successful second term.